”Right. I’m the computer.” Not only that, but somewhere on–no, in. In!–my body, I had a slot for that card. An electrical portal.How was that even possible? How could you have a part for a memory card in your body and not know about it? While I enjoyed it enough not to have to bribe myself (totally been there, though! ), I agree with what you're saying. Especially the Hunter part (I couldn't even remember the boy's name!). And I'm curious about the MIT student, too! I'm with you in this review, Maja. So many bloggers loved Mila 2.0 but it just fell totally flat. Love interest played a big part in her decisions when she barely knew him and all of the constant "my life is lie" got on my nerves. Awww, so sad to see that you didn't have as much fun with this one as me. I totally get what your saying, I think around the halfway mark I kind of let go and just decided to go along for the ride and it was a really fun read. I do hope that in the next one the romance gets cleaned up a bit and we find out exactly what was going on with Lucas. Fabulous review, Maja, love the honesty! I think a lot of people had a problem with this one. I am really hoping that the second book ties in all the loose ends and gives Mila more character too. I really wanted to love her but most of her personality was pretty impersonal. I still don't trust Hunter though! Who takes things like that so well with very few questions? Hmmm. This book has definitely inspired a mixed bag of opinions which I always find really interesting. I don't love that it ends in kind of a random place and with a myriad of questions, but like you said, the premise is really fascinating. Still, I'm not sure the concept of Androids is quite fascinating enough for me to want to tackle this book given all the questions and the unnecessary romance. I love romance in my books, SO MUCH, but I need it to be an integral part of the story, not something that just feels tossed in. Thanks for your thoughts Maja! Huh, I've been reading mixed reviews about this one. I have to say the Michael Bay references that reviewers make about the action makes me hesitant to pick it up. I haven't liked a single Bay movie yet. I think I'll wait to read a few more reviews to decide whether or not to pick it up. I enjoyed more than you, but must admit I wondered about Hunter as well, but I guess he was convenient there at the end for help. I've heard a lot about this book and honestly, it doesn't seem like something I would read. Thanks for the honest review! ugh i hate it when there are so many unsaid things in a book. It KILLS me.. anyways, its disappointing to hear about the romance... because I was excited to read this one. But after you and my sister's reviews, i don't think ill be picking it up anytime soon. Great review Maja! Dang it! I have this scheduled for next Monday and I have been reading some pretty lackluster reviews. I thought this would be a good one. Oh well at least there isn't a love triangle, right? I will see what I make of it and come back and compare notes since we tend to agree on our thoughts more often than not. I have to be honest that I haven't been drawn to this book. I don't mind the android angle since I do read SF, but I am glad I didn't take the plunge. I think I would have the same problems and I also hate having too many threads unbound. Always bugs me. Well, I do think I'll pass on this one for sure. O__O I keep seeing negative reviews for this high potential book, which makes me sad. It seems like most readers have a huge problem with the thickness of the book, the fact that it could have been condensed to a mere 300 pages. Also, the characters, especially Hunter and Mila's mother. I'm quite curious to read about them, but now I know what to expect going into the novel. Thanks for your great and honest review, Maja! You and I felt the same way about this one, though I don't think I'm ready to continue with this series once the sequel is released. I couldn't make sense of Lucas's role in this book either. It was definitely strange, though Hunter's presence perplexed me just as much. Great review, Maja! You said it all brilliantly. 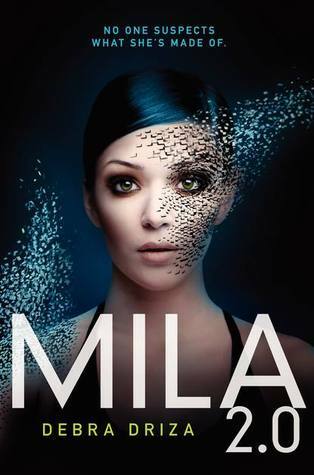 I haven't read the book but for a story like this, I'd really want to find out more about Mila through someone with insider type of information. Seems like the cast of characters isn't a convincing bunch but I'm glad to learn that you'd give its sequel a chance. Loved your honesty, Maja! Haha, I love that you bribed yourself to finish this. :-) This review pretty much sums up my disappointment with this book. I dreaded writing up my own review, because I had SUCH high hopes for this one, and I just found so much of it boring. The first third of the book especially dragged for me. There were some fun aspects for sure, and I did let myself get as swept up as I could, but overall I was pretty let down. I think this premise in another author's hands might have been something special. Also, I completely second your WTF? at the love interest being tacked on. I did not get the point, and could have totally done without Hunter. Great review! This is the first negative review I've come across for this book. I was a bit worried that it could get boring or lag because of the length. I don't really like it when there are a lot of things left unexampled, even if it is a series. I'd rather just have one or two things left unknown. Great review! I was afraid of that. Boring that is. Bummer. Sounds like a great setting, but not much to happen. Thanks for the thoughts. I have heard a lot of mixed things about this one. Some love it and others said basically the same thing as you. I think maybe I need to just wait until the next one is out and see if things improve a bit. This seems to be the general consensus, not bad but too many questions. Wonderful review Maji! I really wish more YA books would leave out the romance. It's not always a necessity, and I think it can really hurt a novel. At any rate, doesn't sound like a book for me. Second review for this of the day and both of you seemed to have similar thoughts...definitely makes me shy away. Hmm, I've seen a few reviews of this one and they've all been middling. And, I was so looking forward to this one :( I may end up reading it, Maja, but my expectations have been seriously lowered! And what is up with all these cliffhanger endings lately?! Agreed! Despite all of the action in this book, I found it boring. I know it's because I felt no connection to the characters. I want to read the 2nd book, because I have hope that it'll get better. We'll see! Oh no! Boring, really?? I never would have expected it from a book like this based off the cover and synopsis. This is why I need reviews. Well, at this point, I just don't see this one becoming a priority in my reading schedule. Loose ends and instalove have got to be two of my biggest pet peeves so I fear I wouldn't really enjoy this one either. What a shame! Nevertheless, I'll be curious to see how book 2 fares, as well. I guess we'll see! Like you, I do appreciate when romance is mostly left out of a book, though hearing that a book is also boring is hardly a glowing recommendation, either! It really is a shame, too. And the ending does sound really weird. With the mostly "meh" sentiment toward this book (haven't seen any 5 star reviews), I'll probably keep this book on hold until the rest of the series is out. Too bad that you were so bored by this. I actually found it very engaging, but can see where it would go either way. Like you, I found Hunter's character troubling. I get Mila's obsession with him, since he's pretty much the only experience she got to have during her 'human' life, aside from a bitchy friend, but I do not understand his thinking. I'm REALLY hoping that he's actually evil. That would be great.